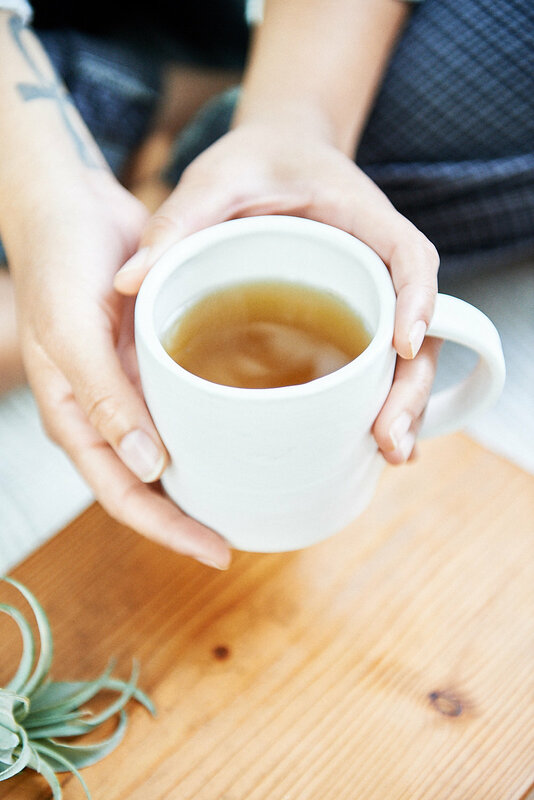 3 Ways to Self-Care with Chamomile | Big Heart Tea Co. The holidays are pretty much here, right? So consider this a universal reminder to self-care and rest up. Here’s some simple tips to help you get herbal with your self care routine. Working with and connecting to whole herbs, like chamomile, can seriously boost your mood. I mean, just looking at it makes you smile. It’s beautiful, fragrant, naturally sweet and your best friend when you want to relax. Chamomile has a distinct apple flavor with a lot to offer your self-care routine. Make a STRONG and healthful brew by steeping 1 oz chamomile for 10-15 minutes in 185 degrees water. Drink 2-3 cups of tea daily to support the nervous system and reduce stress. Brew before bathing to avoid the mess. Just add one cup of chamomile in a one-quart jar of hot water steep until cool, strain and pour into bathtub. You skin will be silky and smell really sweet, promise. Soothe those computer screen looking eyes and look away for a sec with a warm chamomile press. Fill two compostable tea bags with chamomile, secure, dampen with warm water. Then lie on your back and chilllll. Pro tip: If you don’t have compostable tea bags you can always rig up a coffee filter or muslin cloth and tie with the string. We keep it real.